Claiborne used to support the death penalty. He believed the death penalty was ordained by God. The more he learned about the subject, the more troubled he became. He talked to victims’ families, exonerees, executioners, and his fellow Christians. He’s now convinced that the death penalty needs to end once and for all. 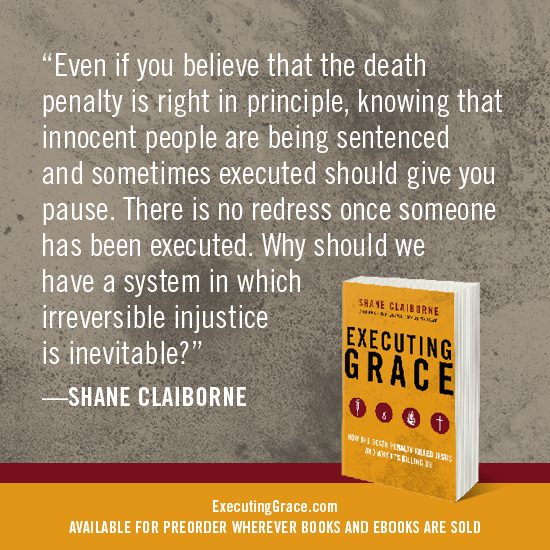 In Executing Grace, Claiborne explores the contrast between punitive justice and restorative justice, questioning our notions of fairness, revenge, and absolution. At times, he also dives into the Bible and into history. EJUSA has worked with Claiborne on many occasions, including organizing events at Wheaton and Calvin colleges, presenting together at the Christian Community Development Association conference, and meeting one-on-one with Evangelical leaders to talk about redemption, racial justice, the risk of wrongful convictions, and other problems with the death penalty. We could not be more thrilled about this book and are already in the middle of reading it!